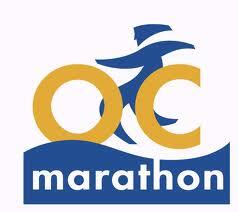 I did this race three years ago and returned for the Beach Cities Challenge. The course went through some changes since last time -- less time in the "back bay" area and definitely more elevation changes. I remembered it as a flat course, but this one had rolling hills, including longer climbs at Mile 8 and 11. Rolling hills are normally a strength of mine, at least in the past. "The Ukrainian" had to pick up my packet for me on Friday since I couldn't get out of work to get down there, and I had a conference on Saturday. He reported that the expo was small and crowded, and he didn't come back with too many goodies. Back of the shirt. For some reason, it said v-neck on the D-tag, but it's not? I've decided not to bash my time, although I normally would, with it being five minutes slower than the last time I did it. Today wasn't really a day for PRs or anything, even though I wanted to... but I was burned out from last week's half-marathon and had some technical issues in the beginning. We arrived at the OC Fairgrounds well in advance to catch the shuttle to the start at Fashion Island, but for some reason they were not loading the any shuttles until well after 5:45 am. Note above that the race begins at 6:15. I'm not really sure why they did this, but it definitely made a lot of the runners waiting in the lonnnnnnnnnnnnnng shuttle line very nervous. By the time our bus got to the start, my corral (Corral A) had already taken off. I had been counting on using the port-a-potty before the start, to um, clear out my stomach since I had to wake up at 4 am and things just don't move at that hour. Anyway, I decided to just start with Corral B (which we barely made to in time) instead of prolong my start any longer. Mistake??? These splits are not the greatest, and that's because I spent the entire race feeling like I was holding back everything I ate yesterday. TMI, I know, but ugh. At around Mile 4, I had this really long debate with myself whether or not I should stop to use the port-a-potty or just run through. I decided to just run through because I'd rather slow down 10 minutes than spend 10 minutes in the port-a-potty. I'm not sure what most people would have done, but I tend to make these sorts of "just get through it" decisions. Around that point, I gave up trying to run any good time and decided to just "survive it." My stomach felt so full that any Gatorade I was taking was revisiting me... so bitter... ugh. While I could have avoided drinking sports drinks, I was sweating a TON due to the humidity or whatever was overheating me even though it was overcast. Later, I found out that "The Ukrainian" probably over-sweated since he was fighting calf cramps toward the end and finished slower than usual. My energy was not where it needed to be today, so I tried to focus on the course itself. I would say that this course was only a bit less boring than in the past, though I would have appreciated more time near the coast. By the end, I couldn't even pick up my pace because I really didn't have much left in me. I knew at around the mid-point that sub-2 was not happening today, and I was okay with that. When I crossed the finish line, I saw a puddle of red blood on the right side and medics giving CPR to a gentleman on the floor with blood all over his face. I moved out of the way with the other finishers, but the sight was rather terrifying. No matter what my time, I'm always glad to finish each race in good condition. Some people don't. I hope he's okay. I still think I like this shirt, even if not v-neck. The medal is nice, too. Looking sunken & deahtly = not having a good time (pun intended). Good job Nobel4 for toughing it out. I saw the downed runner at the finish line also and hope he is well although it didn't look good. Congrats on another amazing race. You are a running rock star, love the race medals! Cute race shirt - and sounds like you pushed through like a champ!